One of the hottest new things in outdoor grilling is a natural gas grill or barbecue! 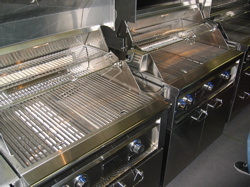 Most grill producers make natural gas versions of their gas grills or grills dedicated to burning natural gas. Also, convertor kits are available to convert most propane gas grills into a natural gas burning grill. Note: You can't just plug a propane gas grill into a natural gas line and have it work! Propane burns about 3 times hotter than natural gas per volume of gas. This means you need a different regulator for a natural gas grill that supplies more gas to the grill faster to get the same BTU's (heat!) in your barbecue.Besides being convenient and easy, a natural gas barbecue is cheaper to operate and cleaner than most alternatives! Why don't I explain the advantages and disadvantages of natural gas grilling for you right now? No more running out of fuel! - Tired of worrying if your propane tank will last through the party and constantly having to run to the store to get a new tank of propane? The cost adds up and its simply a pain. Charcoal is used up fast too and you can only store so many of those big bags. Natural gas is already supplied to your home (it's the same thing your stove runs on) so you have a constant supply without ever running out. Unless the gas company goes out of business, you've got a regular source for clean-burning, inexpensive natural gas for your natural gas grill for a lifetime. Its cheaper - Natural gas is cheaper than propane, and definitely cheaper than constantly loading up on big bags of charcoal. The price varies from area to area, but in general, per BTU of heat supplied to your natural gas grill, natural gas is about 3 times cheaper than propane. Actually, its about 6 times cheaper, but you'll need about twice as much because propane gives you more BTU's per volume. However you figure it, a natural gas grill or barbecue is cheaper than the alternatives. Its cleaner - Natural gas burns much cleaner than propane and industrial charcoal. That means that its both better for the environment and its better for your heath! No more stinky byproducts of combustion, natural gas is the "green" alternative for your outdoor grill. Easy on, Easy off - All the advantages listed above, plus it has all the convenience of a gas grill. No dusty, sooty charcoal mess, no fussing with lighter fluid or chimney charcoal starters, simply turn it on when you want to cook and turn it off when you are done. With a natural gas barbecue installed, you are ready to start grilling anytime without hassle! No wood smoke flavor - Just like a propane gas grill, natural gas does not impart a smokey wood aroma to your cooking food. This flavor and aroma is definitely part of the appeal of outdoor grilling. However, don't give up on a gas grill just yet! The solution: Buy a smoker box! A smoker box is a small metal box which allows you to add wood flavor to your gas grill. You simply soak your mesquite, hickory or other wood chips in water and then put them in the smoker box. 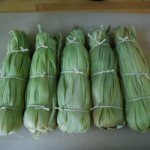 The box sits in your grill by the fire and the heat in your grill causes the wood to smoke, throwing off savory aromas that permeate your cooking food. Aromatic smoking wood chips and chunks are widely available in supermarkets and grilling specialty stores. Installation - A free-standing charcoal or gas grill or barbecue doesn't need any special installation. You simply wheel it to where you want it and start cooking! A natural gas barbecue needs a natural gas line (obviously!) to supply the fuel. Most of us have natural gas supplied to our houses, but unless you luckily already have an outlet in the right location, this means you have to get a new line installed. While this isn't a big deal, gas line installation should be left to a professional! Don't hurt yourself trying to install a new gas line on your own. Contact your gas company for recommendations on contractors who can do the job quickly and safely. That tally looks like 4 to 2 in favor of a natural gas grill! And the disadvantages aren't even that major. 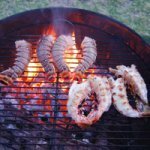 So it seems that a natural gas grill is definitely a great option for an outdoor grill or barbecue! Get a fire pit to cook or to stay warm on your patio. 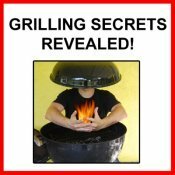 Done learning about a Natural Gas Grill? 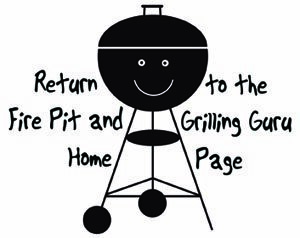 Go back and find out about other Types of Grills and Barbecues.